Poznan, Poland, a little after 3 am on Saturday, December 13 The 14th conference of parties to the UN Framework Convention on Climate Change (unfccc-CoP) and the fourth meeting of parties to the Kyoto Protocol finally closed after two weeks of pointless negotiations. Governments failed to reach an agreement on almost all key issues, including the emissions reduction targets of developed countries and how they would fund the actions for emissions mitigation in the developing world. Agreement on the adaptation fund, a crucial financing mechanism to help the most vulnerable fight the impacts of climate change, was perhaps the only achievement of the Poznan talks; there was, however, no agreement on the amount of money needed. The urgency for action was summed up by Colombian delegate Juan Lozano Ramirez "We are not asking for a lot here. The voices of weeping victims have not been heard.We are talking about an emergency, but many seem not to have felt their pain." The Poznan talks, attended by more than 11,000 participants, represented the midway point of a two-year negotiating process that kicked off at Bali in December 2007. Government representatives from 189 countries met from December 1-12 to negotiate a global deal that will come into effect after 2012--the year the first phase of the Kyoto Protocol ends. The big decision at Poznan was to agree "to shift into full negotiating mode in 2009". But developing countries feared that the unfccc secretariat, considered to be EU dominated, would draft the negotiating text, which would not take into account their concerns. They fought for the agreement that "all parties would put forward further proposals regarding the content and form of the agreed outcome" which will be considered in the drafting of the text. Deadline is June 2009. In the buildup to the meet, developing countries had submitted proposals on mitigation, adaptation, technology transfer and the architecture of the global financial mechanism for climate change. Poznan saw little movement on these key areas. At the high-level ministerial session, the chair of G77 and China, John Ashe, said they expected an initial response by the developed countries to their proposals. There was none till the end. Developed countries had expected they would negotiate their future emissions reduction for the post-2012 period; even that came to zero. Developed countries that are signatories to the Kyoto Protocol are already committed to reduce their emissions by 2012. By 2000 their emissions should have fallen to 1990 levels and then continued to decline to an average of about 5 per cent below 1990 levels by 2012. Far from stabilizing by 2000, emissions from developed countries show upward trends. Developing countries including India stressed their earlier demand that developed countries, as a whole, must reduce their emissions by 25-40 per cent of 1990 levels by 2020. "Developed countries are not interested in talking about reducing emissions," remarked a negotiator from Brazil. Instead of following up on their commitments, developed countries have now placed a precondition to their actions. 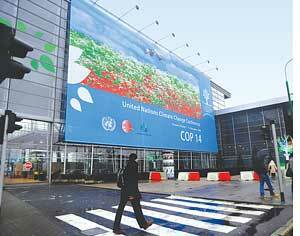 They want developing countries to take on binding targets to reduce their emissions. Japan continued its call to differentiate developing countries based on the stage of their economic development and shares of greenhouse gas emissions--a proposal, which was endorsed by many developed nations. G77 and China firmly rejected any proposal directed towards differentiating between developing countries saying such an idea was contrary to the principles of the unfccc. Ashe said this approach bordered on the immoral and was counterproductive. Most discussions, efforts and side events in Poznan had a single-point agenda getting developing countries to take up commitment to reduce emissions. Rich nations worked extra time to cook up projects and methodologies to force developing countries to commit actions whereby rich countries will buy credit at cheap rates and without any domestic reduction. Developed countries pushed hard to reach an agreement on the funding mechanism for paying developing countries to not cut or use their forests. Known as Reduced Emissions from Deforestation and Degradation (redd), this scheme if fully implemented is supposed to save 20 per cent of global emissions. 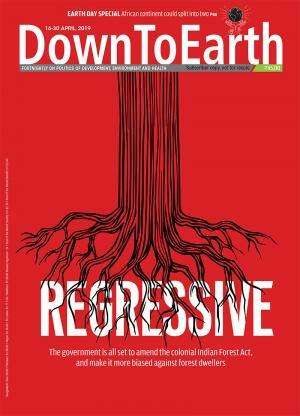 Though the rich nations wanted to harness this opportunity, the worst polluters among them opposed the recognition of rights of indigenous peoples who live in these forests. This became a sticky issue and no agreement could be reached. The US, Canada, Australia and New Zealand firmly opposed use of any language in the agreement text which recognizes the rights of indigenous peoples and local communities. To the dismay of indigenous peoples' groups they succeeded and the final draft only referred to "participation" of indigenous people. But the pettiest point in this entire debate was the use of word "people" instead of "peoples". The "s" means that indigenous peoples have the right to self-determination and have collective rights. "These four countries want to include redd in the future climate agreement, but they oppose protecting the rights of the indigenous and forest peoples who will be directly affected by redd measures. This approach will fail," said Victoria Tauli-Corpuz, chair of the United Nations Permanent Forum on Indigenous Issues and executive director of tebtebba, a Philippines-based indigenous peoples' organization. The final text on redds has called for a meeting of experts to focus on methodology before the next negotiation meeting. 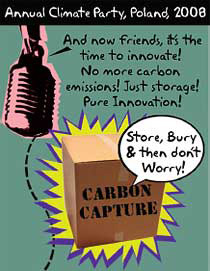 Carbon Capture and Storage (ccs) emerged as one of the most controversial issues. The division lines were clear. Developed countries like Norway and EU as a whole, Australia and Japan, with strong support from Saudi Arabia, pushed for ccs to be included under Clean Development Mechanism (cdm). Developing countries led by Brazil, Venezuela and Jamaica protested against inclusion of an unproven technology. At heart are issues like technology, liability, legal, ethical, financial and methodological aspects. In a very strongly worded submission to Subsidiary Body for Scientific and Technological Advice (sbsta), Brazil said "The appeal of large quantities of cheap credits for Annex 1 (developed countries responsible for biggest emissions) countries should not hide the bad consequences of taking ccs under the cdm ...It would destabilize the carbon market, would be a perverse incentive...and would prevent further equitable participation." ccs entails capturing carbon dioxide emissions from coal and other fossil-fuel based power plants and factories and store it permanently in geological formations underground. Questions have been raised over ccs being safe. 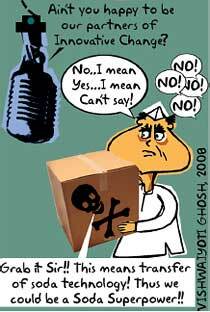 But the most controversial aspects of ccs are the liability and environmental impacts. ccs is expected to increase environmental impacts due to mining activities because coal-fired plants with ccs need 30 per cent more energy and hence coal. Brazil said that project proponent liability in the current scenario is limited to 21 or 60 years, the longest period cdm is currently dealing with. But beyond this there is uncertainty about who will be liable. Existing proposals moot transferring long term liability to host developing nations. Brazil protested against this saying this is "unacceptable for it means that private profit in the short term will be supported by public loss in the long term". 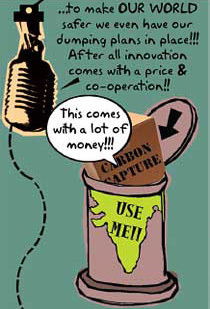 In its statement at the plenary session Jamaica said that cdm cannot be used as a testing ground for ccs technology. Venezuela wanted to know why the developed countries don't implement ccs in their own territory if they consider it to be safe. 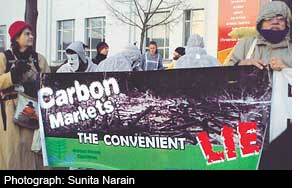 Owing to strong protests the sbsta "did not agree to adopt" the inclusion of ccs under cdm. Over the past year or so there has been much debate on the concentration of atmospheric carbon dioxide required to stabilize the climate. Notable among these was by nasa scientist James Hansen who said that a carbon dioxide level of 350 parts per million (ppm) was the most likely threshold. Current levels of carbon dioxide concentration are at about 380 ppm and rising. Developing countries have pushed for adaptation and finances to support these activities. An adaptation fund has been proposed. The fund generates its revenue from a 2 per cent levy on proceeds from projects under the cdm. Developing countries demanded direct access to the fund rather than via an operating entity such as the World Bank. Their demand was met in Poznan The adaptation fund, currently about US $80 million, falls way below the estimate of US $50 billion that will have to be incurred by developing countries every year to adapt to climate change. Delegates were negotiating whether to scale up the adaptation fund by placing a levy on the revenues earned from the other two mechanisms of the Kyoto Protocol--joint implementation and emissions trading. However, this was blocked by the developed nations who were accused by developing countries of abandoning those most vulnerable to climate change. No decision was reached on developing countries' demand for increasing the levy beyond 2 per cent. The Indian delegation criticized the refusal of some developed countries to let go a minuscule loss of profits from trading in carbon at a time when climate change was stripping the poor of their homes and their meagre loaves of bread. "In the face of the unbearable human tragedy that we in developing countries see unfolding every day, we see callousness, strategizing and obfuscation. We can, all of us, now see clearly what lies ahead at Copenhagen," it added. Similar views were also voiced by other developing countries. Negotiations will continue in 2009 with the first meeting to be held in March 2009 in Bonn.